How does Time Study RN/MD work? 4. Can what I am doing be done by a lower skilled resource? If so pick from a list of resources. The care giver will continue with the PDA for the entire shift. The alarm frequency has been field tested to ensure that alarm frequency does not overburden the care givers, yet provides the quantity of data necessary for a valid study. At the end of the Shift the Nurse plugs the PDA into it’s charging cable to recharge. The study runs for 7 continuous 24 hour days. Data from the PDA’s is downloaded to a folder on the network and organized by Hospital Unit, Year, and Month. If a hospital is participating in the National Benchmarking Database, then the data is uploaded to the National Benchmarking Database website. 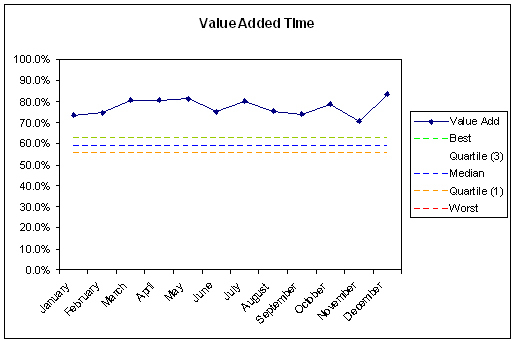 Reports and graphs breaking down how and where time is spent are automatically generated and published to the TCAB team. The National Benchmarking Database is being integrated with RMC’s web site and will be fully automated in the near future. The automation will provide additional reports and flexibility to track any of the 100 different parameters that we track. In addition, it will provide a standardized research platform for participants and for university based research teams. This automation should be complete in August 2009.